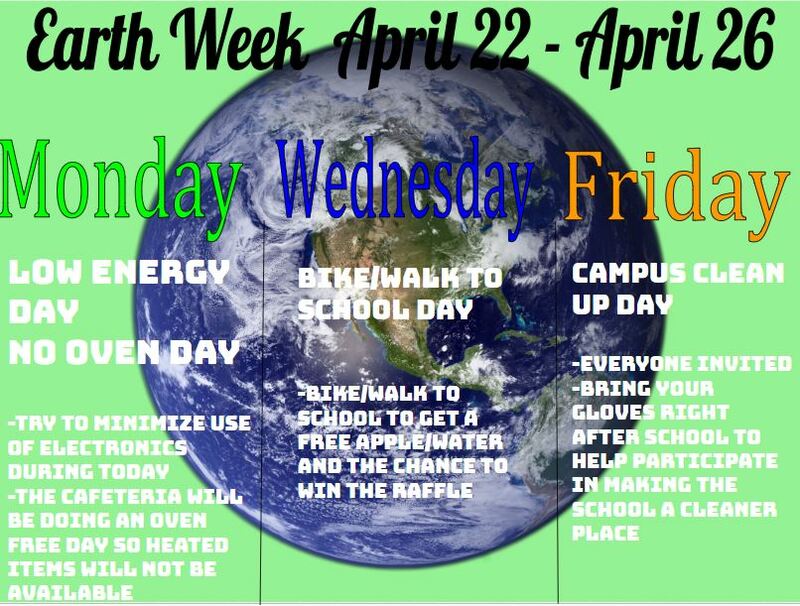 APS will celebrate Earth Week on Monday with a Low Energy, No Oven Day, Wednesday with a Bike and Walk to School Day, and Friday with a Campus Clean Up Day! On Wednesday, April 24th, we encourage parents to bike or walk with their children to emphasize the benefits both to our personal health, and the health of our world, that walking and biking can provide. Volunteers will be distributing fresh fruit to students as they arrive to school, and participating students can enter a raffle for reusable water bottles. Reduce Your Carbon Footprint: By walking or biking to school you are doing something to personally reduce the negative impact of other forms of transportation. For every four miles walked or biked you are keeping 15 pounds of pollutants out of the atmosphere. This helps to preserve our ozone layer and protect our earth. Reuse! Use a Refillable Water Bottle: Bottled water bottles are a strain on the waste management and recycling systems. Don’t use it once and toss it! Recycle! Put your old running shoes to work as basketball courts and running tracks. Did you know that Nike collects and recycles old running and walking shoes (any brand) at its store locations? Don’t just throw them in the trash. Mindfulness: Biking or walking is a way to be kind to the environment and connect with planet earth, and exercise can help to enhance thinking abilities. ← Show Your Anchorage School SPIRIT…Honor Your Child(ren) With A Plaque!